Perched on a little round table covered in a fancy silk cloth we have a King Charles Spaniel. 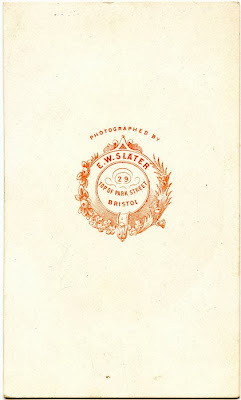 The photograph was taken by E. W. Slater at 29 Park Street, Bristol, England. 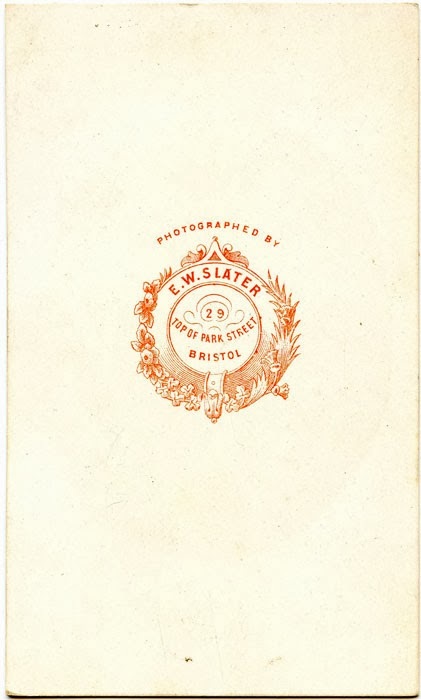 Slater operated his photographic business from various Bristol locations, but he was only at 29 Park Street from 1866-1867, so we can accurately date this image between those years. 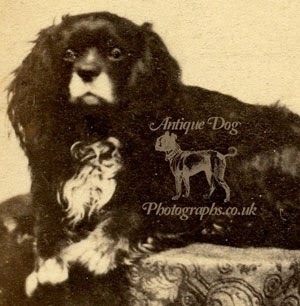 The history of the King Charles Spaniel is rich and long. 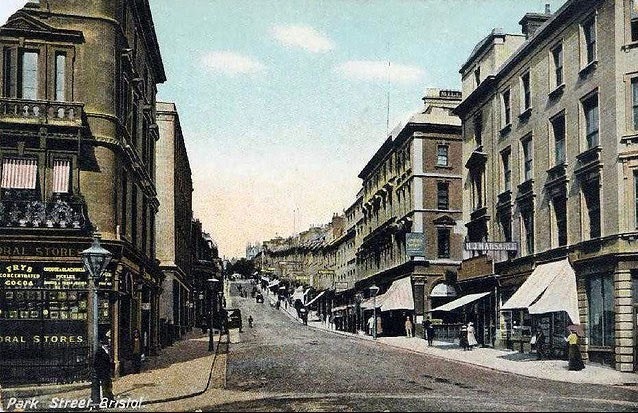 Generally it is thought that they are of Japanese origin, and were brought to England as gifts for Royalty by early voyagers, as early as the reign of Henry VIII. 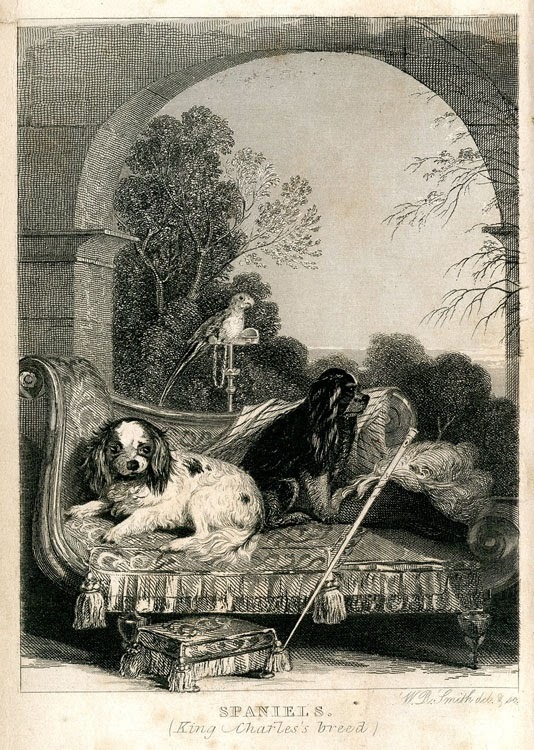 The little Spaniels were named after King Charles II, for it was during his reign that they reached the zenith of their popularity. It has been written the King Charles was rarely without his Spaniels. There was so many they bred in his bed chamber, and over-ran Hampton Court & York Palace (now Whitehall) - to which Samuel Pepys wrote it his diary, the dogs had free access, even on State occasions. 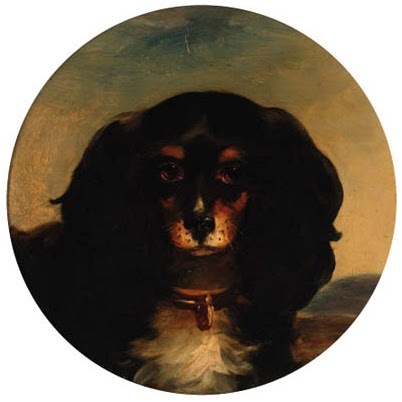 "he might be seen before the drew was off the grass in St James's Park, striding among the trees playing with his Spaniels and flinging corn to his ducks, and these exhibitions endeared him to the common people"
In the 19th century the King Charles was frequently Black and White, as the dog in my photo, or Black and Tan. It was though crossing the two that we have today's tri-colour variety. 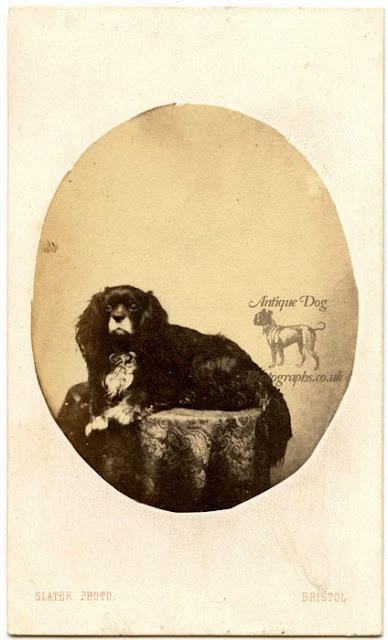 The Painting is inscribed 'The favourite little dog "Spot"/Bowness 1843' on the reverse.